Disclaimer: The StereoPravda SPearphone SB-5 sent to us for the purposes of this review is a sample and does not have to be returned. Thank you to StereoPravda and Misha for giving us this opportunity. Also, thank you to Maria Kazantseva & Analog Sound for conducting an interview on about the SB-5 as part of this review. 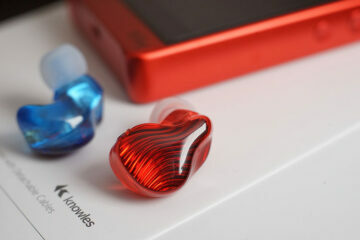 You can read more about StereoPravda reviews on Headfonics here. Around 10 months ago we introduced you to the StereoPravda SB-7 universal IEM. A unique boutique offering from Russia that looked like nothing else, had a fitting like a bed of nails but sounded oh so wonderful. This was a 7-BA parallel single axis design monitor that delivered a neutral but very spacious and transparent sound that screamed reference and sounding wonderfully accurate. It is also $3000. “Big Misha” suggested I try the SB-5 also since it is slightly shorter, hence more comfortable and slightly ‘cheaper’, at $2500. Ever the game audiophile that I am I said sure why not. I am glad I did. This is a different sound signature to the SB-7, one for vocal enthusiasts in my opinion, but it still has many of the SB-7 traits that I really enjoy. The SB-5 is StereoPravda’s penultimate universal IEM in their line-up. 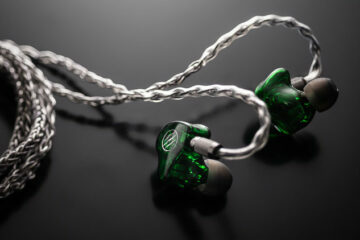 It is just a step below the 7-balanced armature driver SB-7 IEM and one above their “entry-level” version, the SB-3. As before, the SB series does not look like any standard BA built IEM. Instead of grouping the drivers in a typical ear shell configuration Misha has instead lined up 5 BA drivers along the same axis in a cross-over free design. The philosophy that guided his hand to create the SB-7 is much the same as the SB-5 though it would be crude of me to suggest it is the SB-7 negative 2. We kindly requested Misha to subject himself to a sit-down interview with Maria Kazantseva. 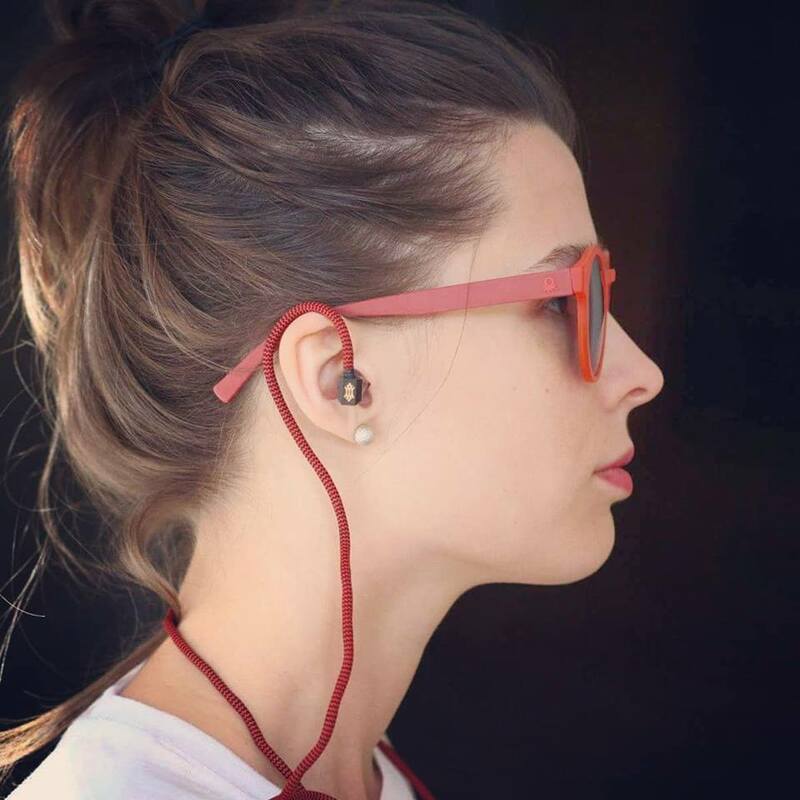 Masha, (Maria), represents a vibrant online group called Analog Sound and is part of the team that manages one of Russia’s most well-known recording labels, Zavalinka Records. In the provided 15 minute interview, Misha (StereoPrvada) offers an insight to the challenges of the SB-5 and its product positioning compared to the SB-7. For those that may have missed the more nuanced details, the SB in SB-5 is short for “to the second bend”. The pitch here is that traditional designs do not get anywhere near the key areas in your ear canal that are most sensitive to sound vibrations. They traditionally sit outside your ear and inject sound via the nozzle and tubes into the ear canal. Even wide single bore or tubeless CIEMS still house the drivers outside your ear. These key areas in your ear canal are just beyond the second bend and thus Misha felt the best design should, as much as possible, be in direct view of the eardrum. The only way to achieve that was to create that single axis design that allows him to create a special shell thin enough to mimic the diameters of your typical ear canal and basically fit. If you have read our review of the build quality of the SB-7 then you will be very familiar already with the design and build of the SB-5. In fact, the only difference in our provided samples is the actual length of the sb-5 driver housing which is a little shorter and partially narrower than the SB-7. Like the SB-7, SB-5 also ditches the traditional shell and uses the single axis shape encased in a very tight polymer skin. The shape and bulges you see are in fact the drivers themselves and the polymer shell forming around the square edges. Comparing both you can see how the lighter driver load of the SB-5 creates a slightly more ergonomic shape as well as being shorter. The body design still has a slight ‘shift’ in alignment so all 5 drivers are not exactly in a straight line despite being on the same axis. Mind you, the shift is nowhere near as extreme as the SB-7 so that may suit some with smaller ear canals. That slight shift is to mimic the ear canals slight curvature and offer a more accurate fit and deeper fit. The internal design has also been tweaked from the SB-7 design. Once again Misha and the team have opted to minimize the use of internal crossover designs using instead Vishay resistors with the drivers in full-bandwidth mode. StereoPravda has done away with the dual driver from Knowles and going instead with a mix of FED, GQ and ED balanced armature designs. The BA closest to the tip is a tubeless and full range driver. The all the rest of the drivers have their own tubing. The unique driver clusters, front and rear, are matched by the Vishay resistors according to the load of each driver (5 per side). I do know from our short visit to the StereoPravda booth at CanJam Singapore 2018 that the cable will be a different one moving forward. Quite a lot of the build feedback from the SB-7 not only mentioned the slightly uncomfortable fit but the rather unwieldy nature of the large cable. I never actually got the chance to assess the new cable and sadly this one is fitted with the older cable so I cannot say for sure how it sounds. What I can say from seeing it in person at CanJam is that it is much thinner and lighter than the original design. It should have much better handling and create less outward or downward pressure on the driver when in your ear. This was one area I felt the SB-7 had an issue with. 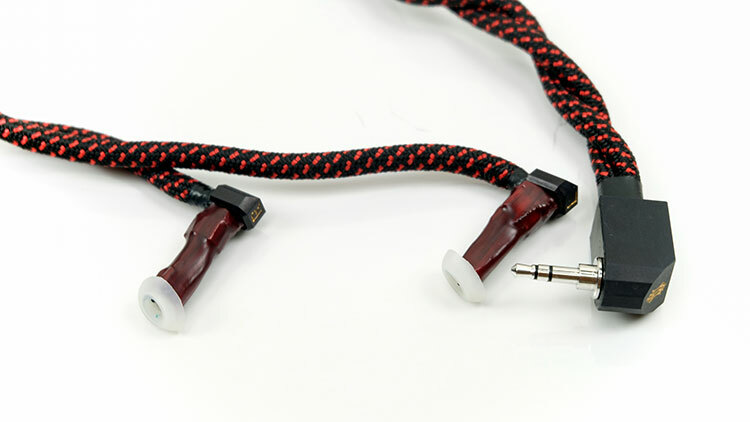 Both cable designs, by the way, are still being done by Chris Sommovigo, formerly of Stereolab and now the founder and owner of Black Cat Cable in Japan. It is 1.2m and thick. Thicker than a headphone cable, possibly the same cable used to kill Jaws in Jaws 2. All you need to know is that is absurdly unique but also very good quality. The Chris Sommovigo design is actually based on a 32-conductor phono interconnect from his previous life in Stereolab. I think they settled on something like the 10th revision before rolling it out as the cable of choice for the SB-7 initially and then the SB-5 partially. I am not sure you can get this cable now on the SB-5 but if you really do want it then, by all means, email them. It does look beautiful as a cable finishing go. It has a lovely two-tone black and red cloth weave jacket and it is surprisingly easy to work with given the size. Memory retention is low though not totally microphonic free. 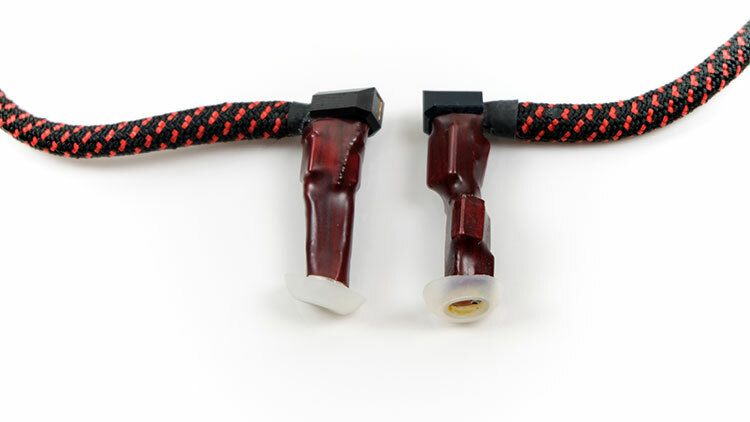 The matching Vishay resistors in the connector chassis and dual fiber core of the wire are primarily responsible for that cable thickness. Each resistor is designed to separately connect to each driver and they reside inside the input connector case rather than the driver body itself. Each resistor requires additional wiring over and above the standard 2 or 4 strands used in normal IEM cables. 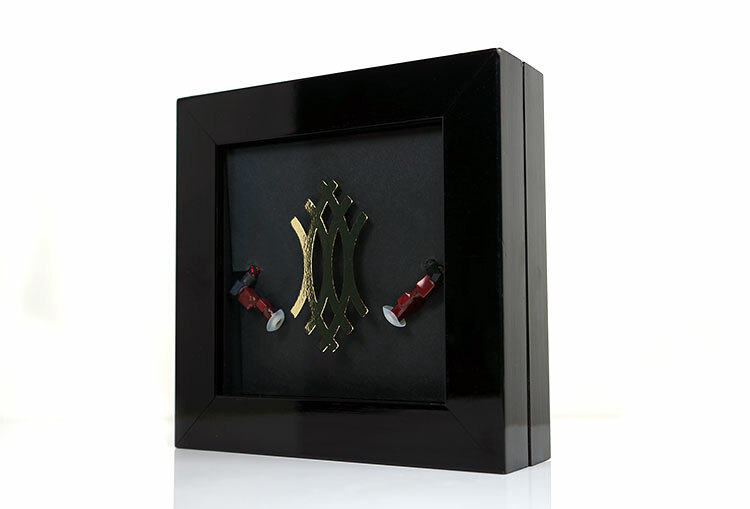 The jack is a right-angled gold-plated 3.5mm stereo and large block barrel to accommodate the heavy-duty wiring inside. The terminated Furutech jack on the SB-5 is different to the finish on the SB-7 jack. It is now longer with about 2-3mm gap between the lock on ports and the jack barrel making it much easier to connect on DAPs that the SB-7 may have had difficulty fitting into. Anything recessed or close to secondary line-in ports will less likely get blocked. Tiny amps with volume pots very close to the jack inputs may still not fit as well with the SB-5 due to the size of the barrel. DAPs such as the Sony WM1A and WM1z work just fine with tons of space. DAPs such as the DX150/200 will also fit fine though they will block other ports. Ok so slightly less painful for the same amount of gain? Possibly, but one thing is for sure if you have not tried an SB series earphone you will be in for a surprise with regards the SB-5 fitting. Whilst not as deep as the SB-7, it still creates an unusual level of discomfort that will take some getting used to. Traditional designs are either tip dependent or shaped to maximize comfort. The SB-5 is neither. It is all about getting to that sweet spot in your canal so you could argue the end justifies the means, literally. As with the SB-7, you need to read the instructions on how to fit the SB-5 before you try it. Yes, read the manual because without it you might find the SB-5 performance to take a considerable dip. The trick is getting the SB-5 in far enough to create a seal at the right point and at the same time ensuring the cable is properly balanced around your ear to avoid creating unnecessary outward or downwards pressure that makes the whole experience too uncomfortable. And, to be honest, it is not comfortable, at least not in the beginning but better than the SB-7. The cable on the SB-5 also has the SB-7 shirt clip and I highly recommend you use it. It is one of the few times I have ever actively endorsed using a clip because it will alleviate the downward pressure on your ears if clipped high enough up. The drivers do have a left and right markings with the left driver on the end of the longer length of cable beyond the Y-Split. The longer side snakes around the back of your head and into your left ear. 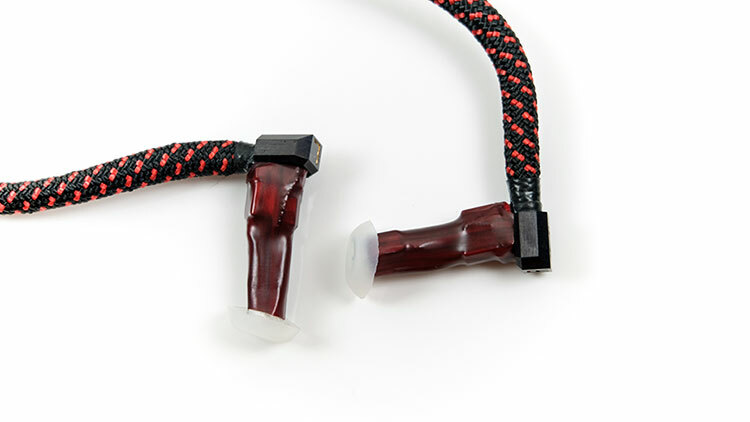 The silicone tips are not user replaceable as they were in the SB-7. You need to be careful in managing these tips as replacing them is tricky and require a level of DIY. You do get some spare tips though so you do not have to send it back if you have the confidence in replacing them. If you notice carefully the tip is actually positioned slightly upwards. This is to mimic the canals slight upwards turn before hitting the eardrum. I would also advise patience with the fit until the tips settle and expand in your ear naturally. If you do not get a seal then try it again with a slight re-position. Avoid overly twisting as I am told the cable wiring geometry is a little fragile to continued twisting. Surprisingly good level of seal but not quite on the SB-7 level simply because the depth of insertion is not quite as long. Ironically, the SB-7 irritated my left canal but felt great on my right canal. This time around the right canal provides the fitting issue and the left is just fine. Perhaps one of the quirks of the slightly different shape of the SB-5 over the SB-7. I am glad Misha decided not to ditch the boutique packaging but it adds a little bit of class and “art” to the SB-5 physical presentation. This is more of a display box than a functional package for easy transport. Yes, the dimensions are fairly standard but the materials are more mantle piece wood finish than Ikea flatpack balsa. 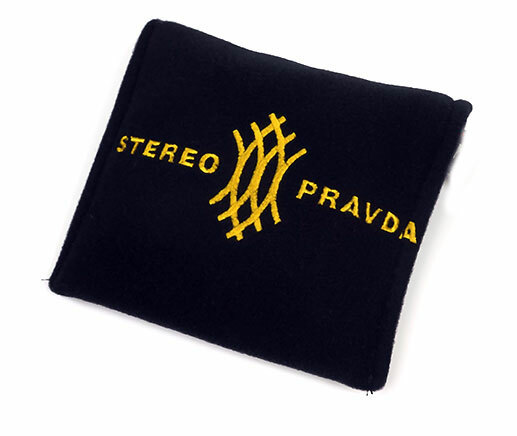 Slip off the cardboard sleeve and you see an impressive glass front with the StereoPravda logo in the middle. Underneath there is a small cardboard cut out with the SB-5 driver shells on display. Below you get a small range of accessories and leaflet sheets. These include several cards on the response curve of the SB-5 and that extensive fitting process as well as the contact details of the company. Aside from that, you receive a soft Velcro fastened black pouch for holding the IEMs on the go. I did mention int he SB-7 review that I felt this pouch not ideal for carrying around the IEM since BA’s are fragile to drops. Since then I have used a small deep-set stiffened zipper pill case to carry both it and the SB-7 around for additional protection. I call it the snake pit! Been doing reviews for 30 years, they could shove a gold bullion up my backside and say keep it and it would not make a difference to my opinion of any item. Mind you it would hurt like hell getting a gold bar out after lol. Regardless, I do appreciate the full disclosure. $2500 IEMs and they don’t need to be returned? Interesting.